While I never claim to have anything unique or different in my lines, because most of what I have is found in the USA... This is a gene that is unique to my rattery. It mutated in my rattery. Its the only gene that has ever mutated in my rattery. I have throughout the years sent it to many breeders. Many times. As I ship to other breeders that I know quite frequently. I have even exported it to France. 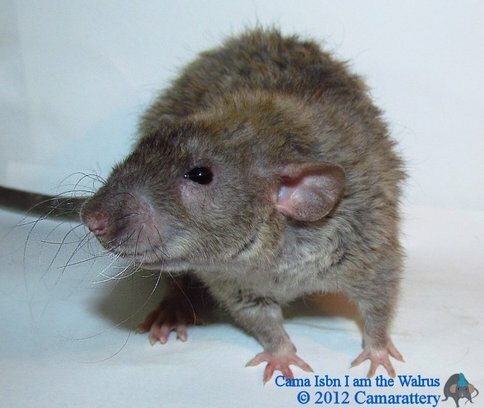 A few people have had a rat act like this Rex but this is long after mine mutated and could be related to mine as people loose pedigrees that link to the origins of lines. Or maybe they do have a different and newer line. My line is co-dominant. And it's always super curly and extra thick hair as a double Rex. Mine never ever bald as doubles. The proper name for this gene is "Cama Rex". All Rex genes around the world "Rex" less on the females and are curlier on the males. I did ship my Rex gene to a breeder in Chicago and the second they got there she broke contract and refused to use my contract instantly upon arrival. She is now lying to people telling them that they are mislabeled Rexoid, and not Rex at all and stating she now needs to work on them to figure out what it is. (mind you she had never bred rats before she got mine and has zero experience). She is doing this while telling everyone shes got something new and rare. She is hoping she can pretend shes made a new discovery so that she can name them and call it her own. Even though we all know its my gene that I made and had for over 10 years and more than 20 generations of. As well as many other breeders in the US and other countries that I have let have the gene too. And we have all had it for years.... As far as this breeder goes however all her breeding's are illegal as I removed her breeding rights when they arrived because of her lies and dishonesty to myself and the other breeder that shipped to her at the time. She refused to sign my contract upon arrival. And instantly broke her agreement with me on any terms we had. And they are registered as non breeding animals on NARR as a result. These are Burmese rats, and dwarf rats in the colors of mainly black and agouti and hairless. So if you see these rats being bred please know that this is the situation. This breeder is very dishonest and is looking for attention. Shes gone so far as to remove my prefix from them and tell everyone the pedigrees I gave her are lies and she has thrown them out to pretend I was never attached to the rats at all. Which is very dishonest. Since then she has claimed mine are from BFF rattery, who I don't have Rex from. My Rex mutated here years before I got rats from BFF. This is likely where other Rex's like mine came from. As she admits to removing my pedigrees from my rats.Right after she got my rats there was a convenient explosion of Rex just like mine all over her area and then got shipped or whored out to many other places, breeders she knows. My Rex are very well known, for many years a lot of breeders on the old forums before FB helped me with this variety as I posted breeding results and litter results. Much much info has been posted about them and proven about them. It is by now an old gene and the genetics are very well known. A single Cama Rex looks like any other Rex. This is a baby and and adult. 2 adult males with the normal Cama Rex gene. Older adult female and older adult male. 1.5 years on both. 2 adult Cama Double Rex. Adult and baby dwarf pictured here. 2 adults. This mod makes a longer guard hair and "whispy" look. 2 dwarf hooded males with the single Rex gene and the Velveteen modifier. Really showing their longer hair. Cama Double Rex + Velveteen modifier causes the coat to be fluffier and longer. 2 adults. What the gene does is give you the false feeling of a Rex Harley. Its longer like the Harley and yet with a strong curl. But as double it never looses hair and gets bald like other Rex genes. As you can see I have worked with the gene extensively. These rats are genetically Hairless and Double Rex. 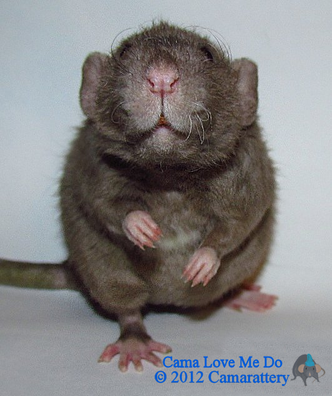 So if bred to a standard haired rat carrying no Hairless you will get 100% Rex that carry Hairless + some will have the dominant Velveteen modifier gene.